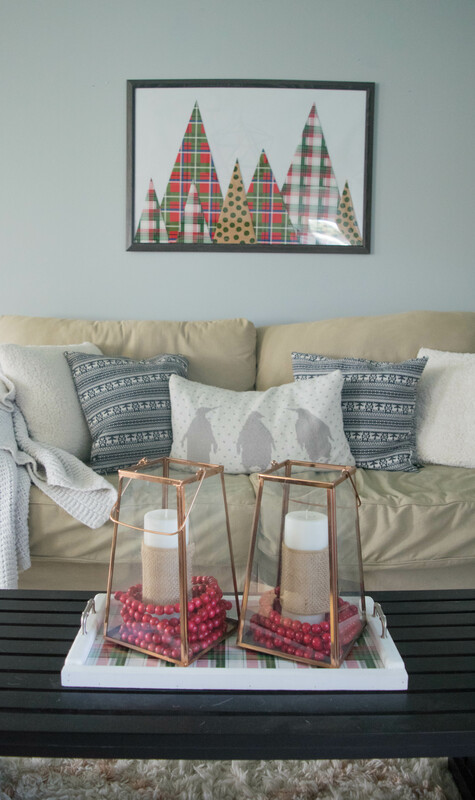 Today I am sharing some Simple decorating ideas, more specifically how to transition your home from the Holiday hoopla to a more universal look that can work for the rest of the year. So many times I have conversations with people, once they find out what I do they start talking home decorating. 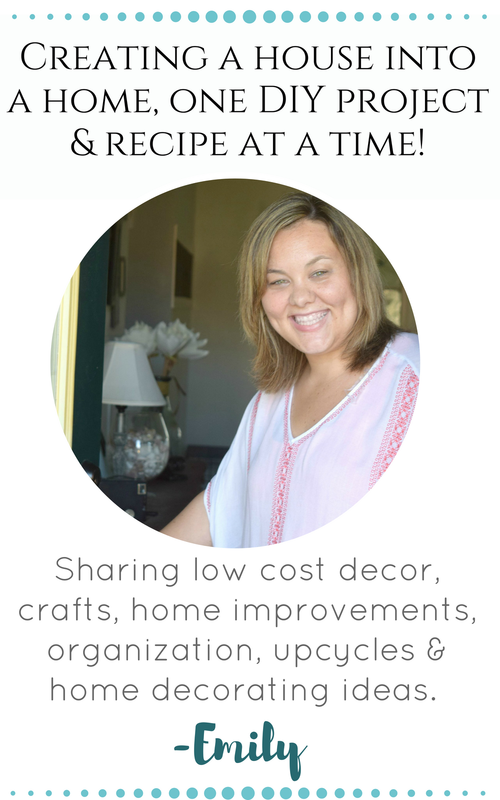 Which I am all about, yes, let’s talk colors, styles and furniture! I am in a happy place when these conversations happen. One thing that seems to stick out in most conversations is that people do not know where to start when it comes to decorating their home, also the mention of money. We all have a household budget and blowing your mortgage money on cute chotchkies or throw pillows is not happening. When I took down my Christmas decor my house was bare, it looked so massive but also really boring. Luckily I have figured out a way to maximize my decor items to make them usable year round. 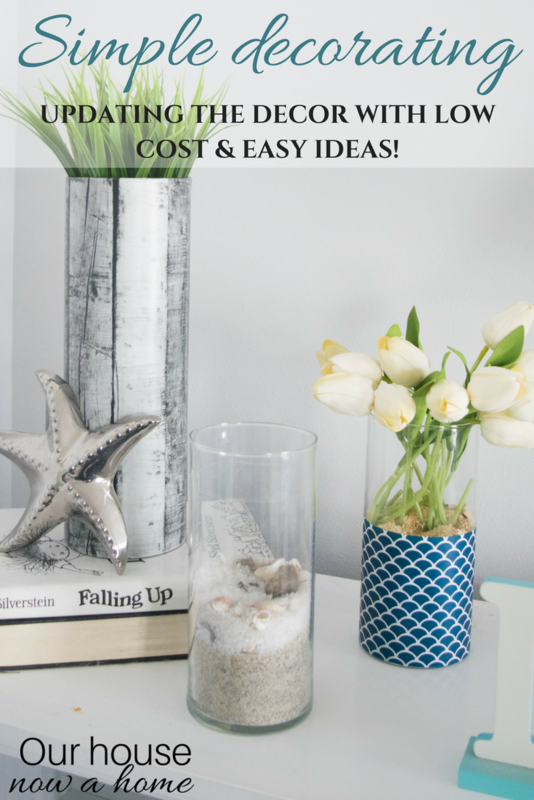 Today I am sharing these simple but effective decorating tricks to decorate your home on any budget. 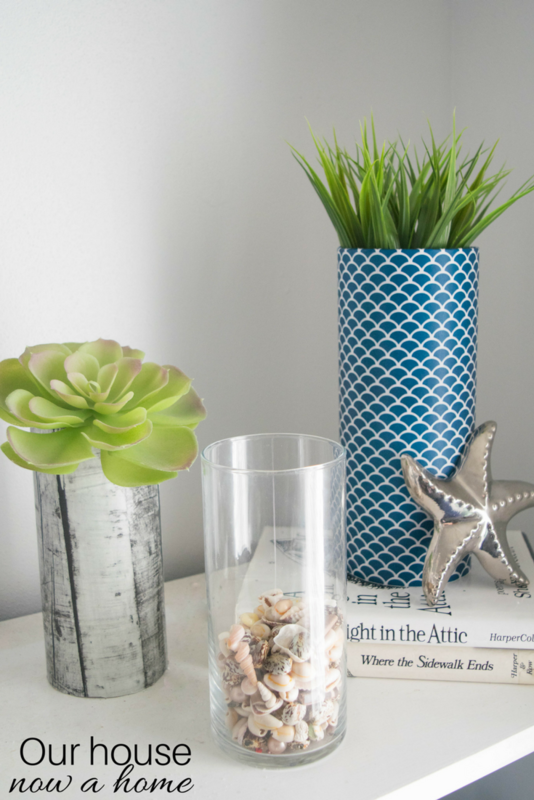 I should mention that next week I will be sharing my revamped home in all it’s coastal glory! This is a tiny teaser before I share the home tour, be sure to watch out for that blog post. Anyways, I have this DIY tray which I use all the time. I change up the items sitting on it and it works. For now it is the home for my lovely Mr. Octopus. Here is the same tray, in the same spot in our family room during Christmas. I also used these glass hurricanes, just in a different spot. You can scroll down to find how I am using them now. 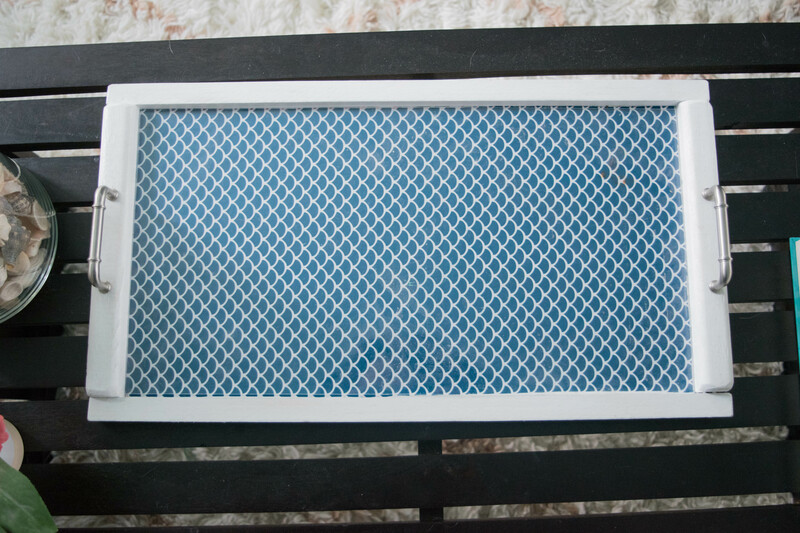 This DIY serving tray is one of my favorite projects ever! I love it so much because I get a lot of use out of it. I made the tray so that the backing can be changeable, I simply update this according to holiday, season or my decorating whims by changing out the paper. Most of the time I use wrapping paper, supppperrrrr simple! Now I just need to convince my crew to get Mama some breakfast in bed using this tray and I am set! 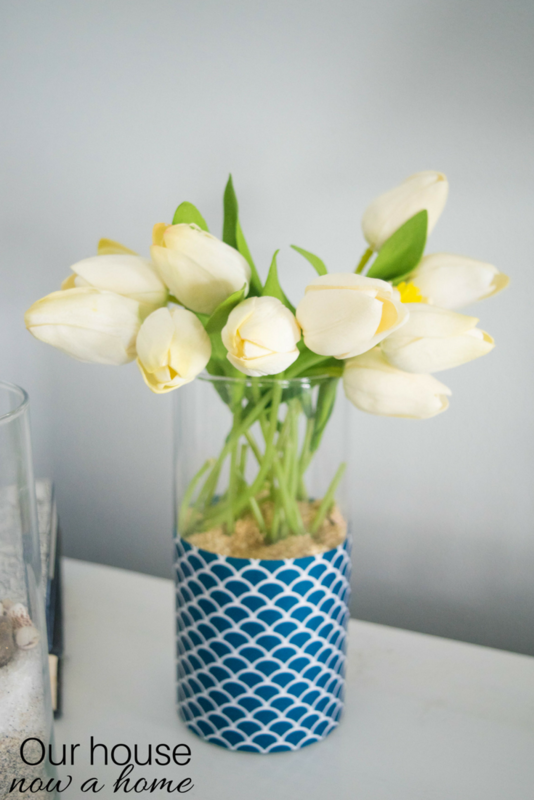 Next is another staple in my home, glass hurricanes and vases. 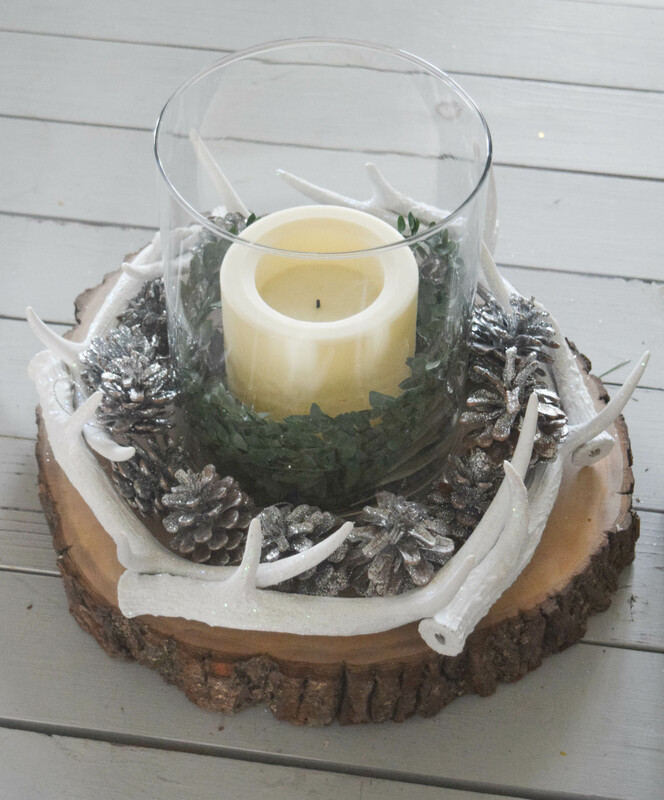 I made this one to be rustic and sparkly for Christmas. Now it is shell-tastic! 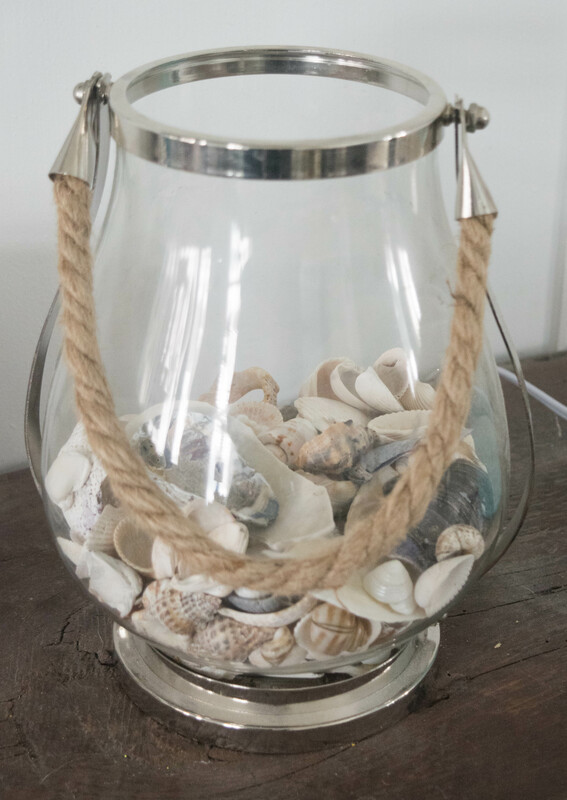 The wonderful part of me having a coastal style home is that; when in doubt put shells in it. I live in Wisconsin but grew up in Southern California, where a little piece of my heart will always remain. We are fortunate to go back every summer for a few weeks and we always come back with a bunch of new shells to add to our home. Books are another fun and simple way to add color, patterns and even height to a table. 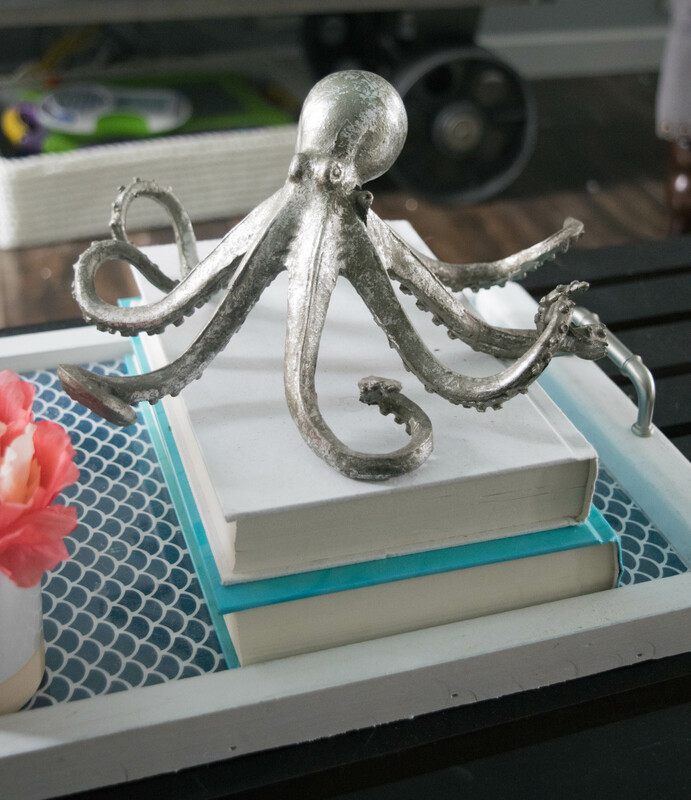 I propped up this octopus on some books and called this serving tray decorated. Like I said, keep it simple. 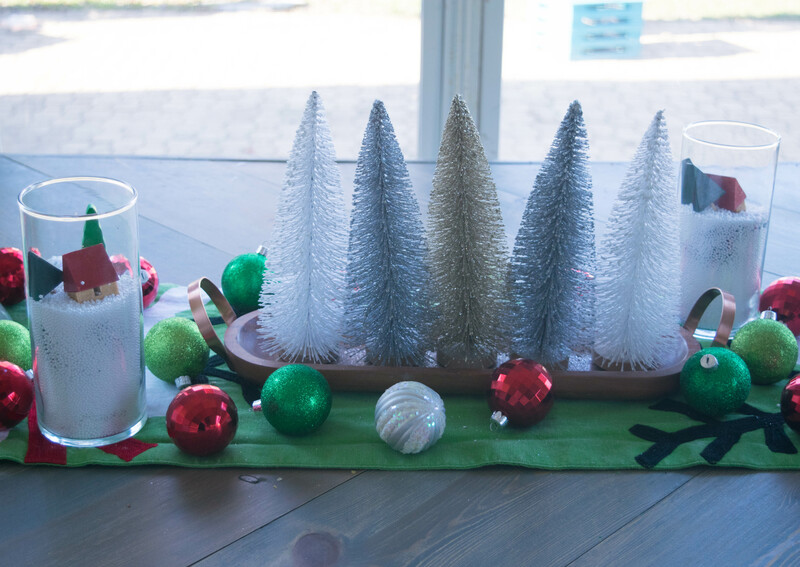 Here is another tray with Christmas trees on in my dining room. 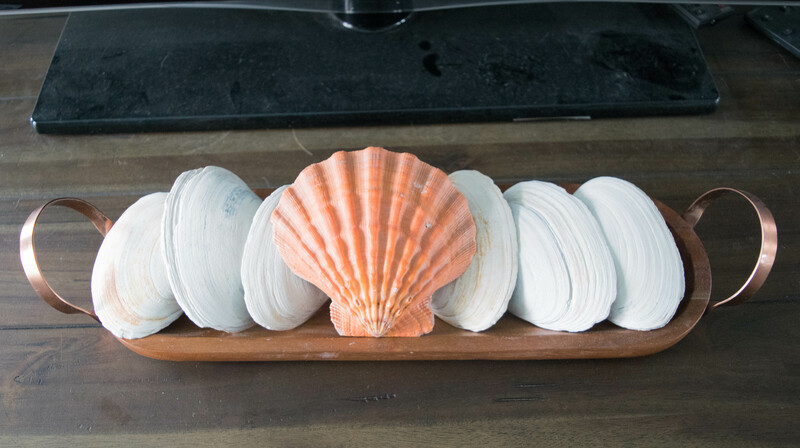 A formation of shells fits perfectly for my home year round with the same tray. 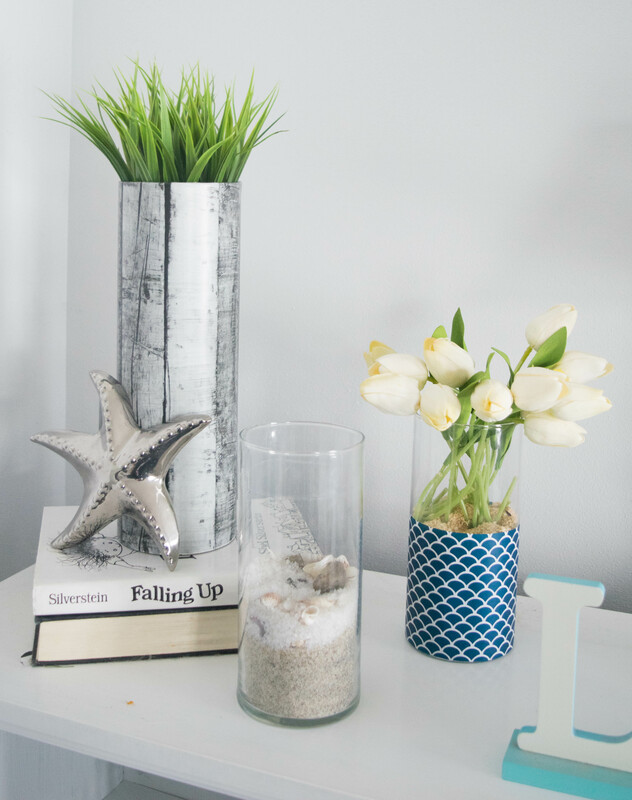 If you are not into a coastal style you can use rocks, pebbles, acorns…. so many other options. I just decided that a blog post about other alternatives to put in these glass hurricanes and trays that are not coastal specific would be a fun post to share. I am on it! Here we go, more shells savings the day! I know I seem shell happy, which I totally am. 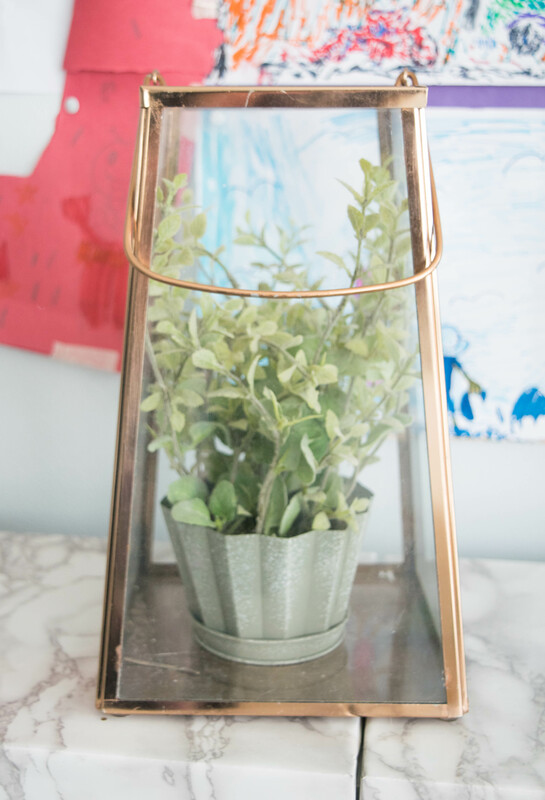 However, I am trying to highlight some of the items that I keep in my home that are easily changed up for different seasons. Same stuff year round means less money spent, less time decorating and less need for storage. 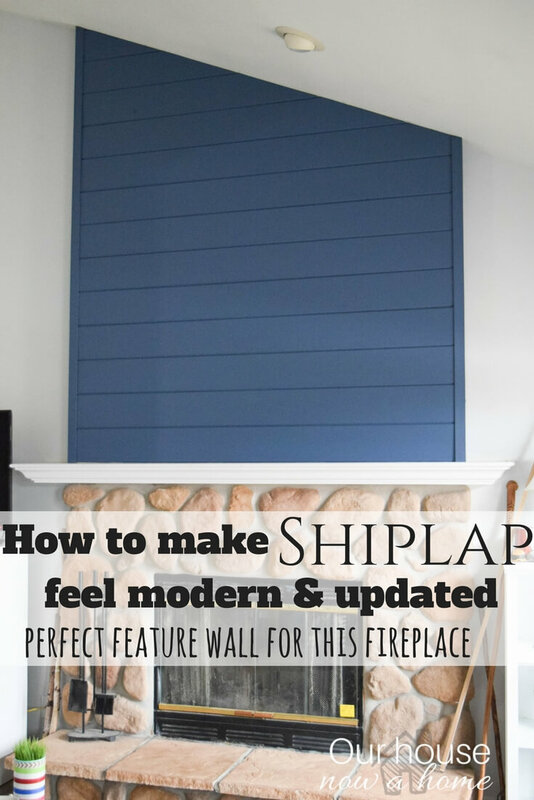 So these ideas can be used in your home even if you do not have a coastal style to your home. 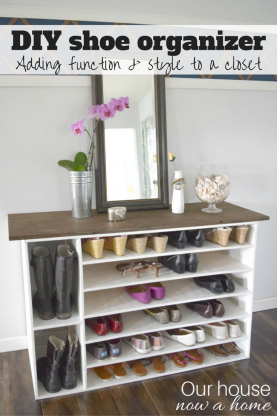 Using the same ideas but making it work for your home. I put little greenery plants into these lanterns. I am loving the mix of the gold lanterns and the silver metal of the planters. 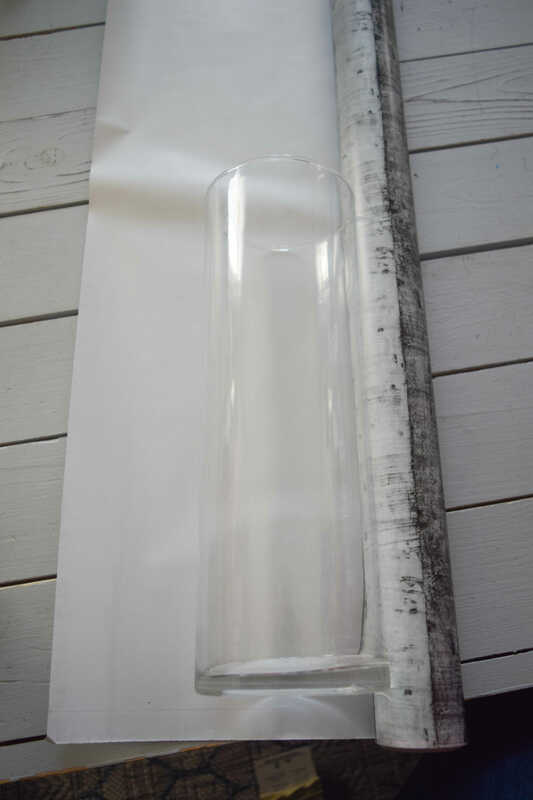 Here is the best way I have found to transition my decor for each season, these glass vases being wrapped in paper. 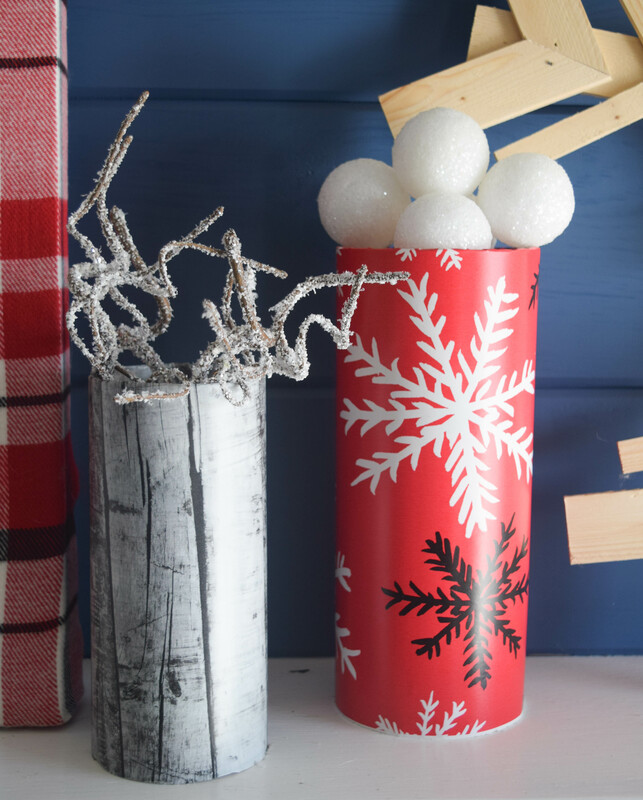 Over the holidays I made some snowballs and other snow covered sticks to dress up these bright and Christmas themed vases. 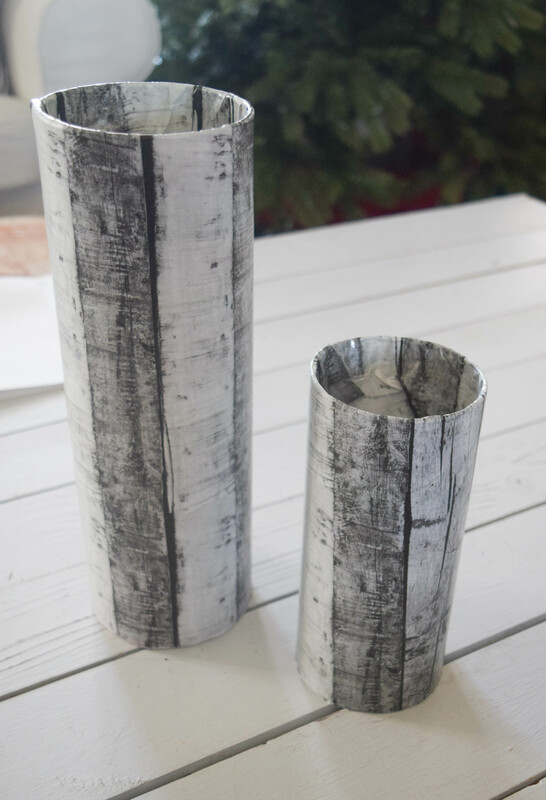 Using the same vases, and even leaving the rustic wood paper I added some bright greenery and other flowers to transition this from Christmas to decor that can be used year round. 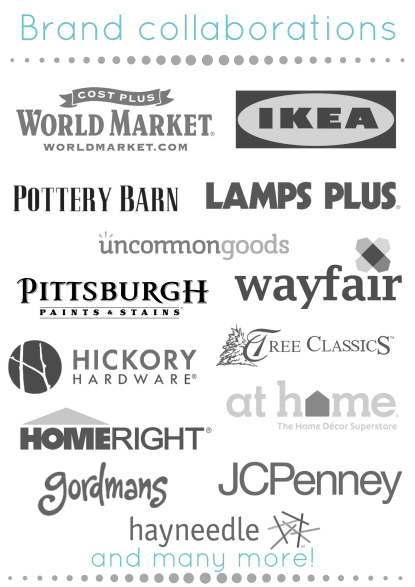 I use these all-the-time in my home. 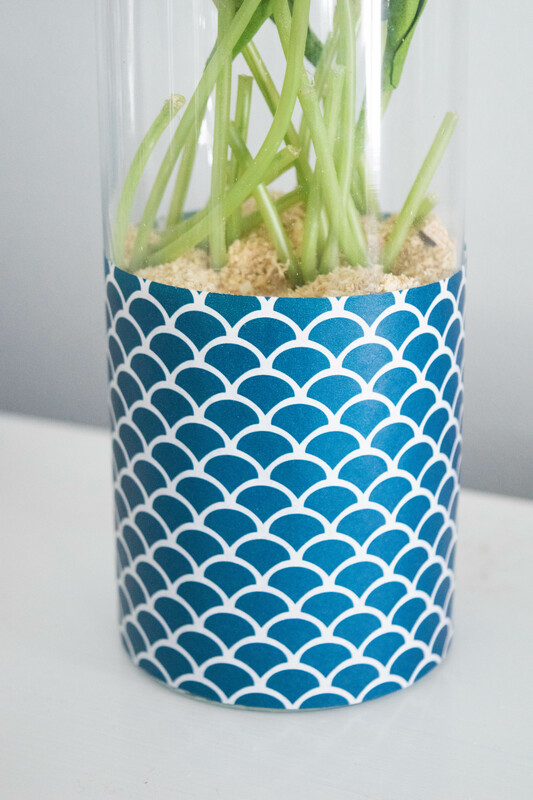 I have a ton of these vases and buy generic wrapping paper like this for these very decorating reasons. Real moment time, yes that is a pencil sharpener in the background. ¯\_(ツ)_/¯ This is my family home, and this bookshelf happens to store a lot of my kids art supplies in it. Hence the need for a pencil sharpener. It is ok though, this is a lived in home. I fell in love with the navy blue paper I saw in the store last year. I will be bummed when I use the last of it! The grass in these vases is obviously fake. 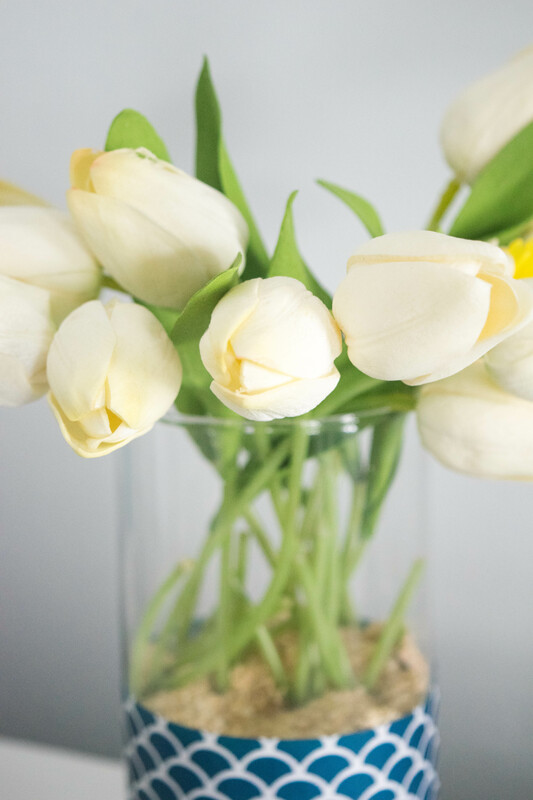 I always worried that using fake flowers meant my decorating style was stuck in the 80’s, not that there is anything wrong with that era in decor. My home is full of life and we are a young family so I want my home to reflect that. No old and dusty fake flowers here. I do love the fresh pop of color these have, it feels very modern to me. Wrapping paper, scissors and tape is all that is needed for this project. 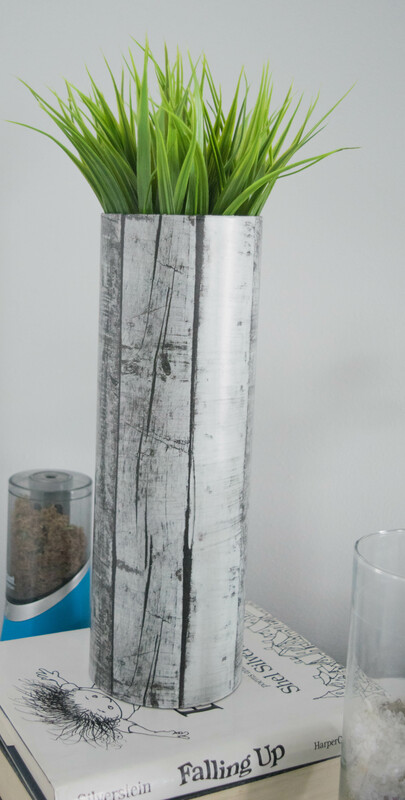 I sometimes set in a towel to prop up any decor items into the base of the vase. That is it! I like to use only tape to secure the paper because I am able to change it up a lot. Obviously I am all about changing my decor, I cannot commit to a vase always being used in the same way, I need options. Oh guys, this is getting me antsy for spring with all of the bright colors! Which, you know…. means it is going to be a looooong winter here in Wisconsin. I am not sure where you are, but here we are having insanely cold temperatures. I took my kids to school and it was -8 degrees outside yesterday. I wanted to do nothing but wrap my kids in warm blankets and keep them home from school. They are tough Wisconsin-ites and acted like it was no big deal, well no big deal as they walked like penguins with all of their snow gear on. No joke, growing up I honestly thought these temperatures were impossible to reach let alone live in. But, here I am. Rocking two pairs of socks, a cozy sweater, and coffee, hot chocolate or warm tea as my only way to warm up. Also fighting the very real pull to hibernate until spring, no errands, food or going out of my home is necessary in my opinion. Regardless of how beachy and California casual my home looks on the inside, outside it is the frozen tundra. 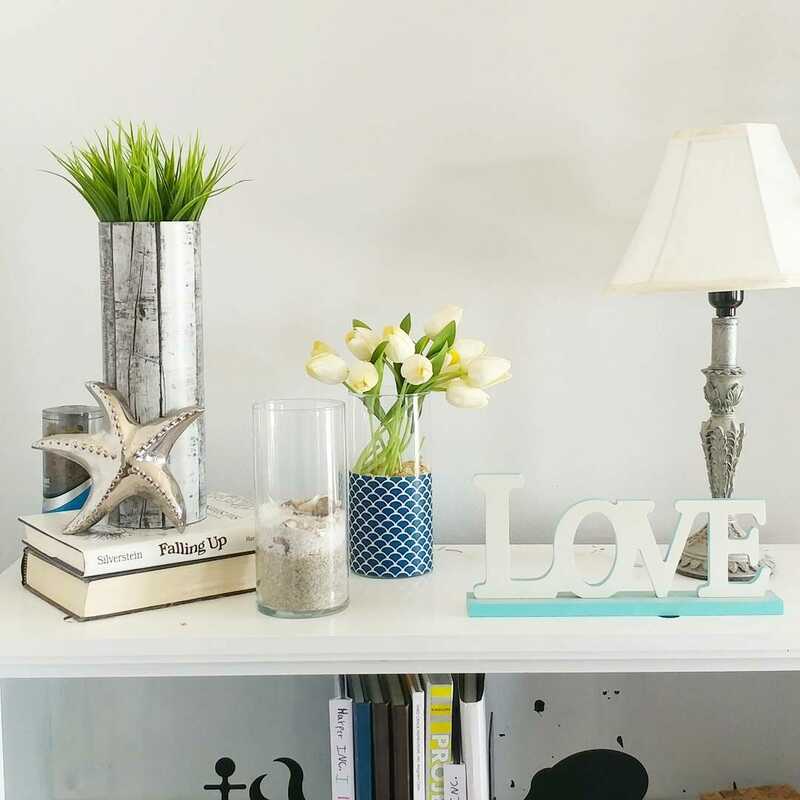 For years I was hesitant to decorate with a coastal style because I worried it was weird to have that style while living in the Midwest, but I decided it was my home and this is what feels right for me and my home. For this little vase I switched up my standard wrapped vase. I only wrapped the bottom half of it in paper. Then I rolled up a small towel and put it in the bottom. Finally I used wood shavings from our various DIY projects and sprinkled it over the towel, setting the pretty roses on top of it. 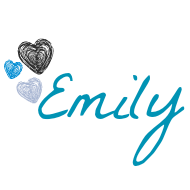 I was going to do a tutorial for this but it is so easy to do I felt the tutorial would be weird. I can only explain the same steps before I feel weird and you all probably get bored. Blue and green is such a great color combination! 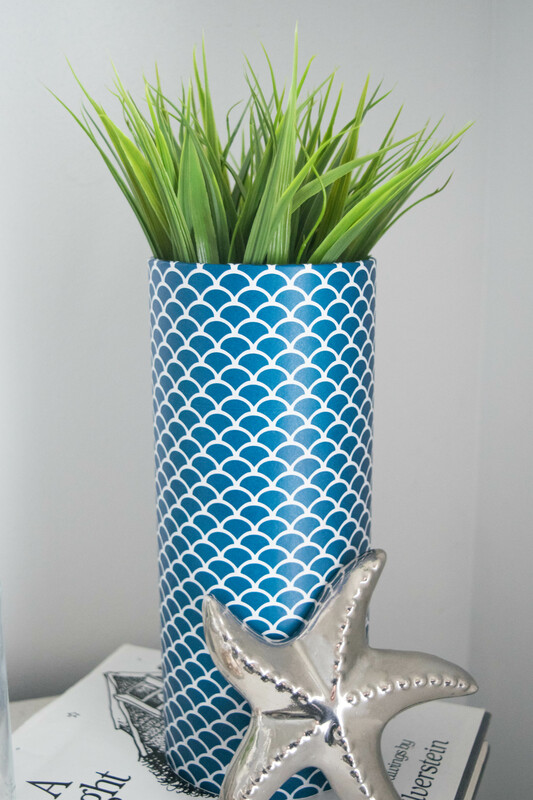 I have always love turquoise but the deep navy color is creeping into my home and I am loving the depth it is adding to my home decor style. That along with bold patterns is what makes my home feel fresh (at least to me). 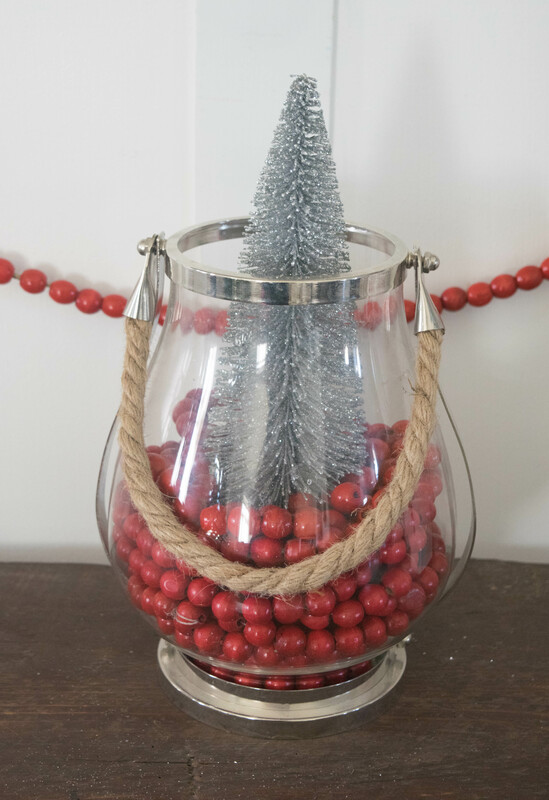 These are my Simple decorating ideas that I used to transition my home from Christmas. 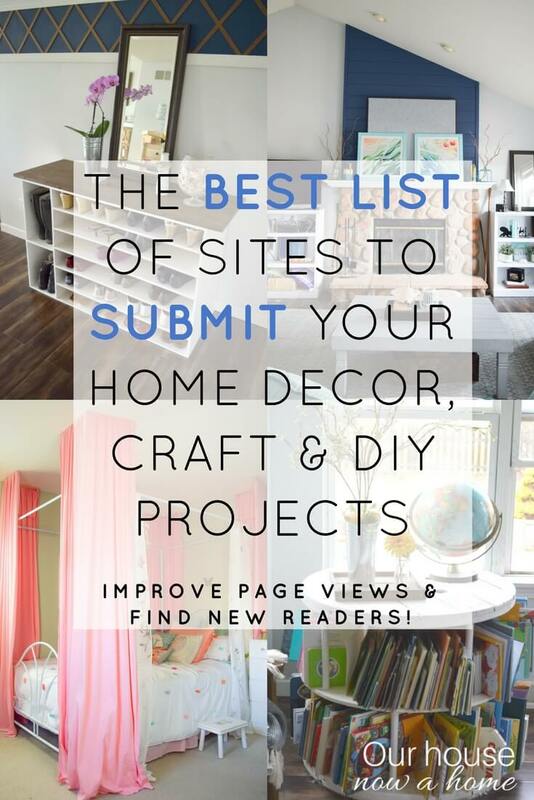 Even though I have this home decor blog I would never claim to be a decorating pro. I am however a regular woman that loves decorating. I also have a typical budget, too much on my to-do list and not enough hours in the day. So keeping things simple is a must for me, as it is for everyone else. 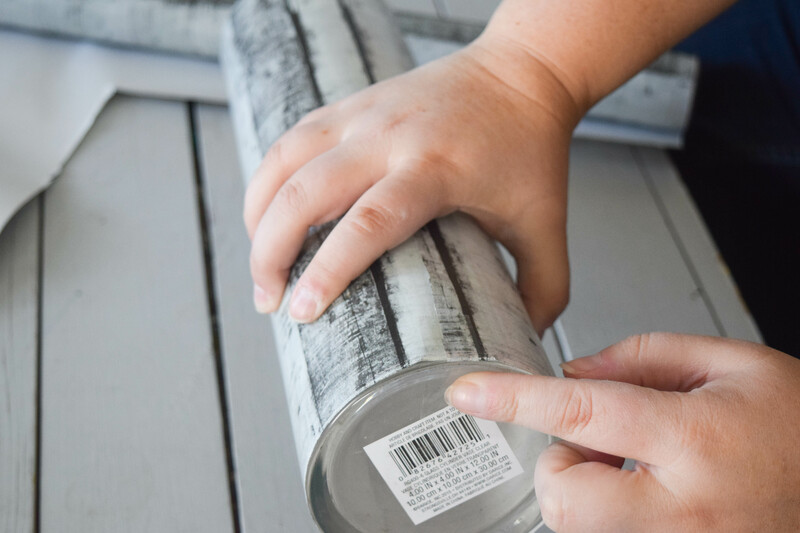 Hopefully these little tips will have you become mindful of using decor items that can be used year round with just a few small updates. If you are like me and dealing with cold temperatures stay warm! I think we have a long way to go before spring starts to show up this year, so I will just enjoy my beachy home, listen to some Jack Johnson with his ukulele playing self and ignore the freezing temperatures for the next few months. I love your whole coastal theme and it how easily you can go from holiday to your theme with a few changes. I also love the idea of that changeable serving tray! What a neat idea. These are all such fabulous decorating ideas. I need to try out a few. My house could use some brightening up. I love the idea of decorating my house and not having to spend a lot of money. I do like to decorate but I do not like to spend a lot of money. Taking and using everyday item you already have around the house and going outside and using items from nature always works for me. 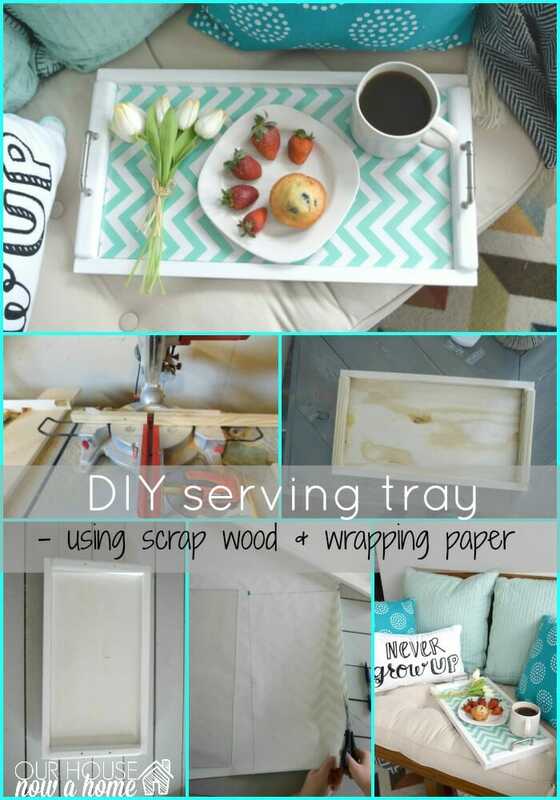 Great use of beautiful paper to decorate and serving tray is easy to make anyway you like. Cute ideas! I’m always so sad to see my holiday decor go because my house looks so naked! 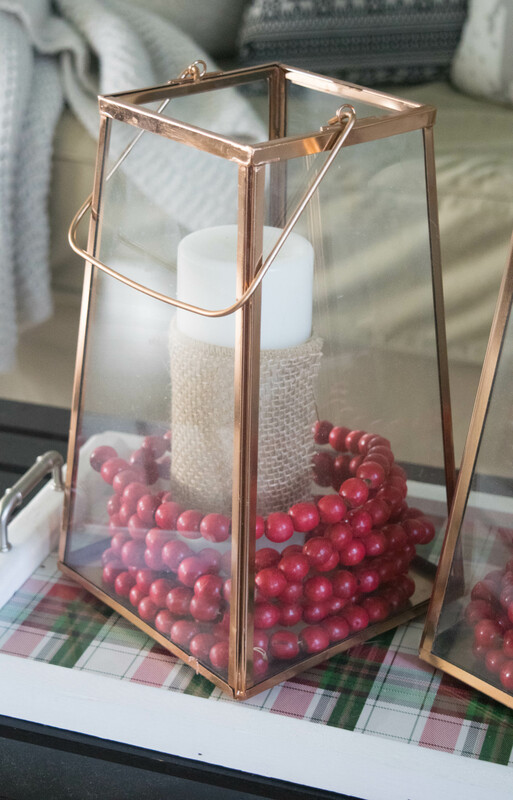 What some absolutely fantastic ideas, I am loving the DIY tray ideas you could really make something so unique to you and the candle with shells just makes me think of warmer weather. 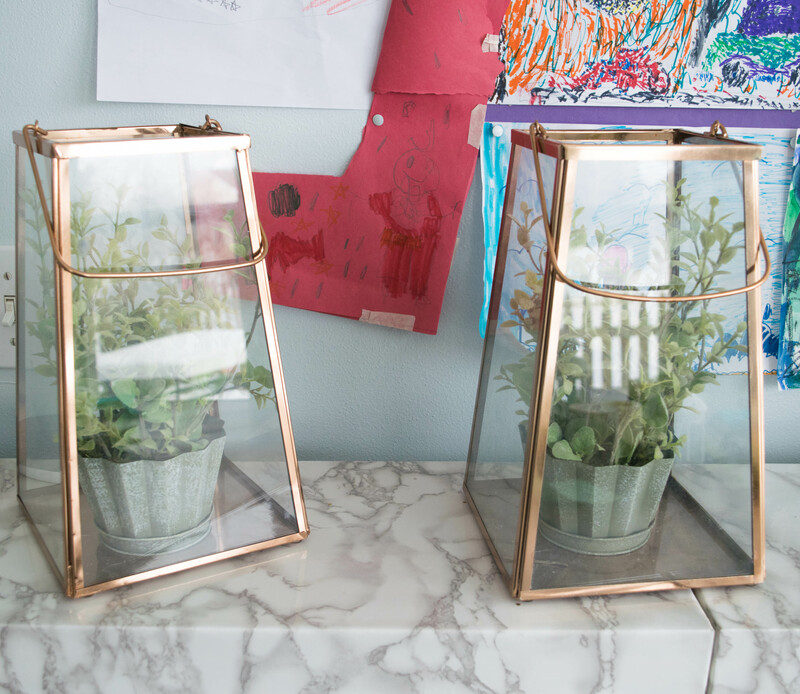 I love the copper detailing on the lanterns. I just took down all the Christmas in the house except the tree. Today’s high temp was 1 so the outdoor stuff can wait 😉 You’ve inspired me to get my spaces in order now instead of waiting! Love this chic and stylish modern look. It’s a great mix of colors. the octopus and star are two great favorite pieces. I love the DIY tray. It’s so cool that you can change it up just by changing out the paper in it. You can switch it up for any look or season. So many great ideas my personal favorite are the gold lanterns with the planters and the tulips. The trays are also beautiful. Not to mention the color palette you are suggesting. Very nice and inviting. I love the coastal theme! I bet it makes such a nice change from all the darker, Christmassy colours 🙂 I need to get myself some glass hurricanes as I always think they look amazing when people decorate with them. I read all the Shel Silverstein books over and over again as a kid so your including them in your pics caught my eye. I like your style! I really love your creations! 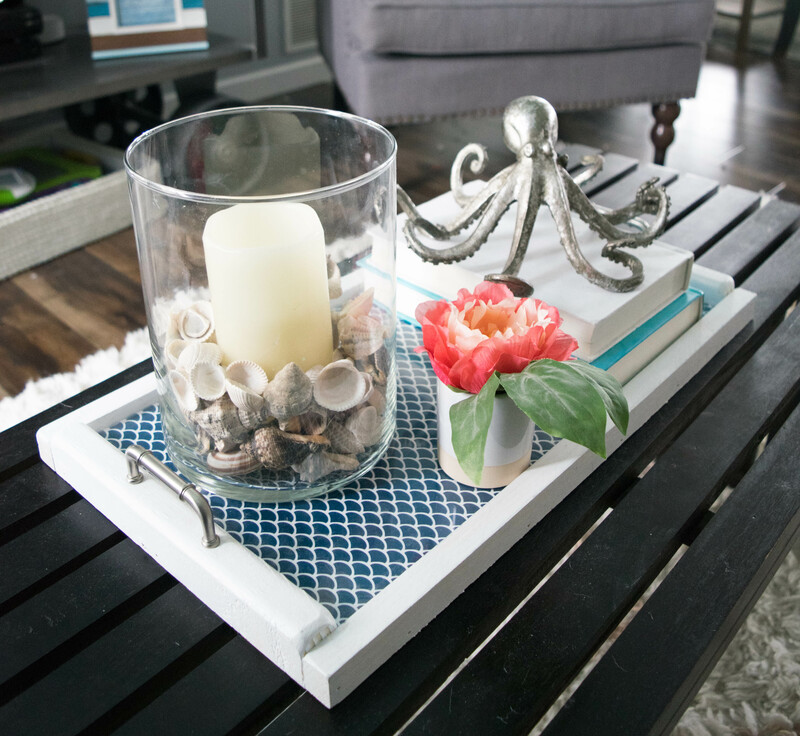 That octopus is a great touch, love this nautical theme. I will try to make some of these ideas. These are smart decorating ideas. I love using trays in my home. They really help to ground a space and create a little scene. These are some really great ideas! I would love to update my home decor. I love this seaside look. My favorite is the gold edge glass containers with the silver planters. I like the play on color and think it would work well in my urban apt! These are all so cute and easy. my favorite is the DIY serving tray. I’m thinking of all the different ways to use it. 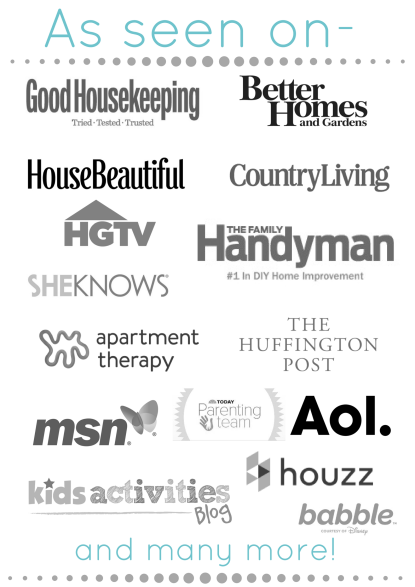 So many great ideas – I also love doing some coastal, although I’m no where near a coast. I have made trays out of cabinet doors too. I need to get my decorating skills up! I love the creativity. The serving tray is the one I like best. I love that you can “change” the design but just using a different colorful design wrapping paper. I love decorative house plants too so those planters look fantastic too. I love how you were able to pull off these awesome ideas! 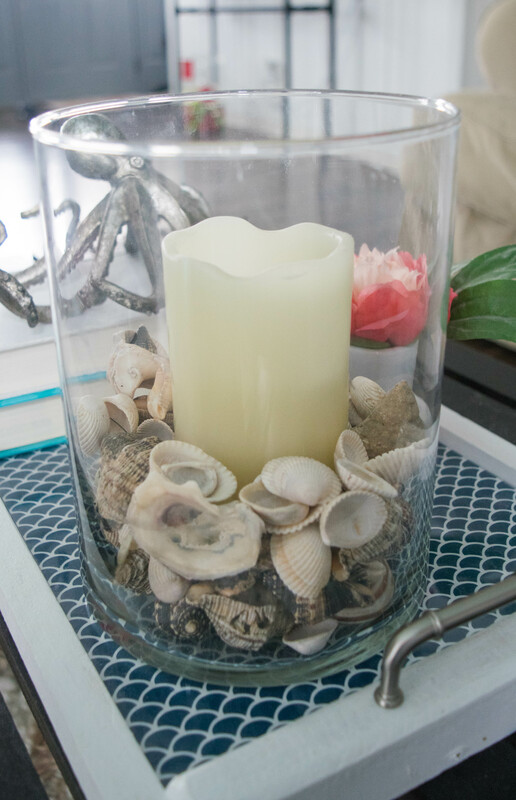 I’d love to do those with seashells and have some beach vibe in my house. Glad I came over this post. I am much inspired and motivated to do the make-over.